The Moon Europa - possibly harbouring extraterrestrial life? The moon Europa is the sixth satellite out from the planet Jupiter and the smallest of the four Galilean moons. With a diameter of around 1,900 miles, it is still the sixth largest moon in the solar system. It lies about 416,880 miles out from its host planet, completing one orbit in just over 3.5 days. Its surface is composed entirely of ice, making it the smoothest object in the solar system. As can be seen in the above image, it is marked with a network of darker lines. These have been christened "lineae" (which is just Latin for "lines"). Several NASA space probes have had close encounters with the moon Europa. Pioneers 10 and 11, plus Voyagers 1 and 2, surveyed it in the 1970s, followed, in the 1990s, by the Galilean Probe with a mission that lasted eight years. 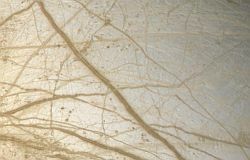 Thus, there are many detailed images available of Europa's features. These dark lines criss-crossing the moon are its most striking feature. Some of the main ones can be as much as 12 miles across and seem to be darker on their outer boundaries, becoming lighter in colour towards the centre. 45 of them have actually been given names! Close examination of these lines have resulted in a hypothesis that they are formed by warmer ice forcing its way to the surface. 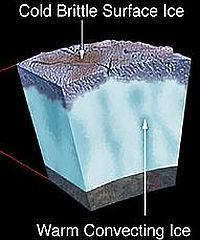 This action is probably caused by fractures in the icy crust, due to tidal forces exerted by Jupiter. Other surface features on the moon Europa make up so-called "chaos terrains". These areas contain "lenticulae" (don't panic, it's just Latin for "freckles"). They may be lumps, pits, or dark spots. How these terrains were formed is still a matter of conjecture, but the most recent study (2011) suggests that these areas actually rest on huge lakes of liquid water, areas distinct from the subsurface ocean (see below). 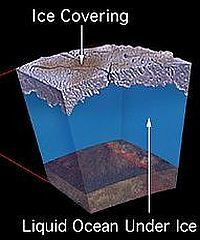 Underneath the icy crust and the possible subsurface ocean, Europa's interior consists of a large mantle and small core. 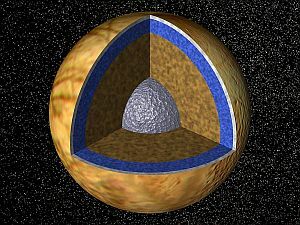 Because of its density, it is thought that Europa's internal composition is similar to those of the four planets of the inner solar system, with a mantle consisting of silicate rock and a core of iron. The ice crust, together with the possible ocean beneath, is estimated to be some 62 miles thick. 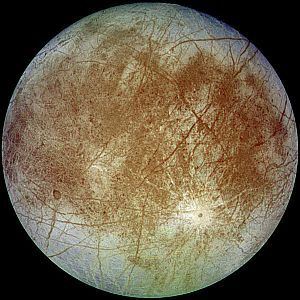 The proposition that the moon Europa might have a vast subsurface ocean of salty water has led to the tantalizing suggestion that it may harbour some form of extraterrestrial life. Its presence, of course, has never been conclusively proved, but observations of Europa's slightly odd orbit seem to indicate some sort of liquid area in the moon's interior. This, together with the presence of the "chaos terrains" mentioned above, being possibly caused by water from the ocean leaking through to the surface, then freezing, make it more than likely. Astrophysicists are in contention over how thick the surface ice is. Most favour the "thick ice" theory, in which it is, on average, around 13 miles thick. Even so, the volume of water underneath that would still be over twice that of Earth's oceans. Because the surface ice is not solidly connected to the mantle, it is thought that they both rotate at a slightly different rate. It is estimated that the outer shell of the moon makes one full revolution, relative to the interior, in around 12,000 years. If there is an ocean of salty water beneath the surface of Europa, water that is being kept warm by the tidal forces of Jupiter, there is every chance that there may be some sort of life forms living in it. On Earth, it was originally thought that, as well as water, life required sunlight to exist. Of course, in Europa's ocean, this life-giving force would be blocked by the ice crust on the surface. However, in 1977, a deep sea expedition to the Galapagos Rift, diving down to 8,000 feet below the surface of the Pacific Ocean, discovered various life forms, previously unknown on the planet. They were clustered around a hot water vent and surviving totally without sunlight. So, as it is thought similar conditions to this would exist in Europa's ocean, the idea of life there is not an impossibility. The moon Europa is, therefore, one of the top contenders for harbouring life elsewhere in the solar system and NASA probes are being planned for the 2020s to go there and investigate further.